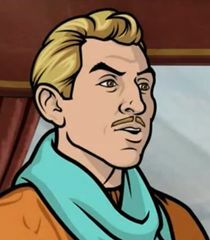 Agent Ray Gillette is the only reasonable person in the Archer series. He too has issues that have yet to be fully explained. He has faked an injury before and convinced all of the other characters that he was paralyzed, however, while in his wheel chair he is injured and becomes paralyzed. In a recent times he received bionic legs, only to have the computer system crash during a fight and render him paralyzed again.